Mission Statement Red Rose Inspiration for Animals, Inc. is focused on saving abused, neglected, and homeless animals. We are dedicated to healing and rehabilitating canines who have suffered from emotional abuse helping them become adoptable. We are a no kill organization that promotes spay and neuter to make a difference in the over pet population of canines and felines. We promote programs that connect animals with people. Red Rose Inspiration for Animals, Inc.a 501c3 is in the preliminary stages of planning and is raising funds to build a healing center/sanctuary for animals. 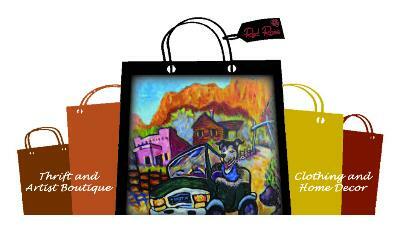 Currently, our primary source of revenue comes from promoting quality Arts and Crafts shows in Sedona. (These shows are also a great outlet for adopting animals from local shelters and rescue groups.) We are always happy to work with other organizations to support animal rescue. Description: Red Rose Inspiration for Animals, Inc. is a non-profit 501 (c) (3) organization that is inspired by a beautiful, beloved soul named Rosey. A Rottweiler/Pitbull mix, she was not only loving and loyal, but highly intelligent—she was a rescue pup herself. Rosey was one of the happiest, full of life, beautiful souls. She touched the lives of those who loved her in a way that may never be the same again. Rosey’s spirit lives on and Red Rose Inspiration for Animals, Inc. has been developed and inspired in her honor to save the lives of various animals in need. Rosey in everyday life! Description: Rosey in everyday life! Peforming at Agility. One of her favorite things to do! Description: Rocky is Red Rose Inspiration for Animals Mascott. Rocky is a rescue who is learning every day that life is going to be okay. He is growing his confidence and learning to love and trust. He's a handsome man who just needed love, understanding and patience. He's a work in progress and is coming along very nicely. He has been adopted into his forever home by the founder and president of Red Rose Inspiration for Animals, Inc Living the good life now and loving every minute of it. We are blessed to have him! Description: Golden Bone Rescue and Rehab and Red Rose Inspiration for Animals worked dilligently with volunteers to find Jasmine a home! Special thanks to Sandy MacBeth for all her efforts. Our good friend Will. Very special thanks to Michelle Lloyd of Sedona Paint Center for finding Jasmines new parents. Description: Golden Bone Rescue and Rehab and Red Rose Inspiration for Animals worked dilligently with volunteers to find Jasmine a home! Special thanks to Sandy MacBeth for all her efforts. Very special thanks to Michelle Lloyd of Sedona Paint Center for finding Jasmines new parents. Description: Golden Bone Rescue and Rehab and Red Rose Inspiration together worked to Save Malbec (from an E List) Now named Sikkim. We got him into immediate foster care and then to his forever home. Volunteers worked dilligently and endless amount of hours keeping him safe as he has severe seperation anxiety. Nadia, Sandy, Will and Evan deserve a very special thank you for saving this boys life.. Also thank you to Audrey The Butterfly Lady for introducing us to Timm his foster parent. Thank you to everyone. Sikkim is very much loved by his new family who is able to be there for him 24x7. Wishes of Red Rose Inspiration for Animals, Inc.
See all wishes from Red Rose Inspiration for Animals, Inc.
We are looking for Volunteers who love retail and love making a difference in animal welfare throughout our community. 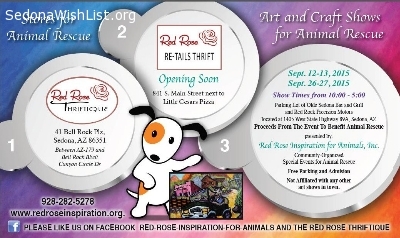 Red Rose Inspiration For Animals is a local 501c3 nonprofit that supports animal welfare since 2009. The shops help the non-profit generate revenue for the various long term existing animal related programs, future rehabilitation center as well as potential veterinary spay and neuter clinic. 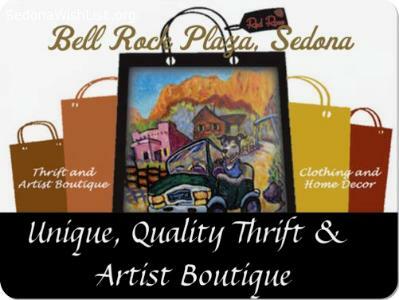 In 2014 the vision for the Red Rose Thriftique a unique thrift store and artist boutique originated from the art shows we organize exclusively in West Sedona. Wanting to provide an upscale, unique, quality, inexpensive, one of a kind shopping experience for visitors as well as locals offering guilt free shopping for a cause. In 2018 the Thriftique was voted “Best Boutique” by the Reader’s Choice Awards. Just recently in 2019 the expansion to the Red Rose Barkin Basement opened offering the organization additional space for furniture, wall art, home décor, and more. Both thrift stores are located in the Bell Rock Plaza in Village of Oak Creek. Red Rose helps pet owners spay and neuter animal companions for free, provides emergency medical services for homeless felines and canines and often assists pet owners on a fixed income to get their animal the veterinary care they desperately need. The focus is reducing the over pet population; preventing felines and canines from potentially being injured, abused or neglected. Flexible days and hours . Please inquire within the store. 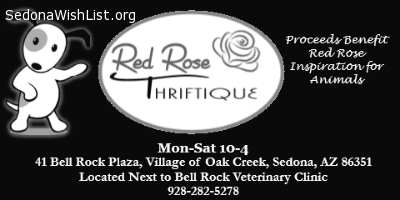 Red Rose Inspiration For Animals is a small non profit founded in 2009 that helps canines and felines throughout the Verde Valley. If you have any small or medium size carriers you would be willing to donate please consider donating to us as we would be most grateful. At Red Rose Inspiration for Animals, Inc.
We are a very small volunteer based organization that makes a huge difference in the community by offering FREE spay and neuter services to pet owners that are financially challenged while low cost spay and neuter is barely even offered for over a year now in this community and can be costly to pet owners on a budget costing up to $100.00 per animal based on weight. We also provide emergency vet care and help with surgeries for seniors living on a fixed income helping them get their animal companion the urgent care they need and deserve. We have a TNR (Trap Neuter and Release Program) for ferals that we provide medical care when needed, alter and vaccinate. We are in the process of opening a new location for our thrift store in addition to our other location. This Red Rose Barkin Basement will have furniture, linens, wall art and much more. We at Red Rose Inspiration for Animals have a Trap Neuter and Release program for feral felines and wanted to know if there are any indoor spaces available to us in Cottonwood specifically as when we trap we would like to keep the cats/kittens indoors prior to and after surgery especially in the extreme temperatures. Giving of ourselves: our time, love and compassion to the animals in need is what is most important to us at Red Rose Inspiration For Animals as we have been providing free services to felines and canines in this community for over 7 years now. However, we wonder what will happen to the animals if we are not able to continue providing services? We have been instrumental in the Verde Valley. Focused heavily in Camp Verde, Rimrock, Cottonwood and Cornville. We are unique as 501c3 in animal welfare as we don’t have a facility and our focus is not taking in animals and adopting them out. Although we have done it in the past and on occasion we will still do it but our specialty is providing services in animal welfare. With all the animal organizations in the Verde Valley we try to be particular and service the community in which we live on a different level as it wouldn’t do the animals any good if we all did the same thing. 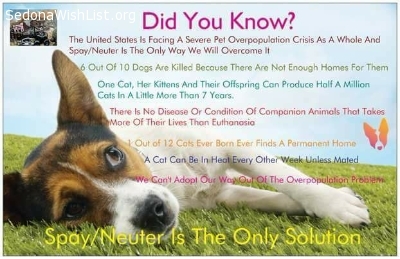 Fortunately, the one common goal we all have is to spay and neuter and make a difference in the over pet population as that is the most important goal for all of us universally. That is what we at Red Rose believe makes the biggest impact within our community. TNR (Trap Neuter Return for Feral Cats) is a service we have been providing regularly since 2012. We have compassionate, experienced volunteers who set the traps and transport these kittens/cats to the vet and then return and release them back to their environment. Young kittens caught early enough are vaccinated, treated medically, altered and adopted out an experience that is life changing obviously for the better. Red Rose has assisted hundreds of pet owners (especially seniors) in dire need so that they don’t further delay the animal having to suffer due to financial challenges. We also assist with free spay and neuter services of felines and canines. Not only assisting pet owners who can’t afford the low cost spay neuter clinics in our community but also homeless animals that are either trapped or found as strays by kind compassionate people that are struggling financially and can’t take on the necessary veterinarian cost. Before moving any animal into the next phase we always encourage individuals to spay and neuter and offer financial assistance when they are in need. Spaying and neutering litters of kittens and puppies and the adult dogs that contributed to their existence whenever possible. Now Red Rose has reached an obstacle in animal welfare as we currently have limited veterinarian partners at this time. We cannot possibly continue the work we do without additional veterinarians. We need more veterinarians willing to provide rescue pricing as we have pet owners wanting and desperately needing the services for their pets, not to mention the homeless animals. Our long term, dedicated, compassionate veterinarian partner since 2012 in Camp Verde is not able to continue assisting many in animal welfare at this particular time being a sole practitioner, without an additional vet. The unfortunate part is many of the veterinarians in the Verde Valley are not willing to provide discounted services and that is a real obstacle for us because pet owners that are financially challenged needing emergency services have practically nowhere to turn if we don't have veterinarians willing to assist us. Many of the people we often assist don’t have credit cards and many try to apply for Care Credit at the veterinarian’s office only to be denied. Then what? Their animal is not serviced and is left to suffer. This has and continues to happen quite often. Another problem is many veterinarians will not provide services to feral felines so they will not assist us with our TNR program either. We have had to cut back drastically in the last 12 months on the services because of this situation. You are probably wondering have we reached out to all the additional veterinarians in the area……the answer is yes and multiple times, with no luck. Thankfully the Village Vet Clinic in the Village of Oak Creek has been helping us out temporarily and with emergencies. Along with Canyon Pet Hospital in Flagstaff and Danza Del Sol has graciously agreed to assist but services are limited. Animals left to continue to reproduce often wind up abused, injured, or neglected as shelters across the country are filled with animals that are euthanized daily due to over pet population as we simply can’t adopt our way out of this problem. We cannot predict when things will change. We are hoping to open a clinic of our own and need additional support. Perhaps we will be fortunate to find a generous, retired, veterinarian willing to volunteer their time to helping our mission or funding for a veterinarian full time salary.. Anyone looking to assist us in opening a clinic of our own we would love to hear from you. Now Red Rose has reached an obstacle in animal welfare as we currently do not have working veterinarian partners at this time. We cannot possibly continue the work we do without a veterinarian. Another problem is many veterinarians will not provide services to feral felines so they will not assist us with our TNR program either. We have had to cut back drastically in the last 12 months on the services because of this situation. You are probably wondering have we reached out to all the additional veterinarians in the area……the answer is yes and multiple times, with no luck. Thankfully the Village Vet Clinic in the Village of Oak Creek has been helping us out temporarily and with emergencies. In August and September 2017 we spent over $5,036.00 and assisted 52 cats, 20 dogs and 1 rabbit. Just recently in October, November and December we spent $3,716.17 and spayed 25 females, neutered 22 males and assisted 8 pet owners with emergency medical services through our compassionate veterinary partners. In the last two weeks no services are being provided because we do not have a veterinarian partner. We cannot predict when things will change. Who knows what the future holds in 2018? Perhaps we will be fortunate to find a generous, retired, veterinarian willing to volunteer their time to helping our mission or we will be fortunate to open a clinic in the future. We encourage our supporters to help us find a veterinarian either a volunteer or a new professional to the area or one that is contracted. When you support Red Rose 100% of the proceeds from our fundraising efforts from the Red Rose Thriftique and our Red Rose Art Shows go to the overall mission of Red Rose Inspiration For Animals. 100% of a monetary donor’s donation goes directly to assisting the animals. No administrative cost or salaries as we are a small, volunteer based organization making a huge difference in the lives of animals throughout the Verde Valley. On our 990 for the year 2016 we had a 99.98 percent rating for public support which we are quite proud of, as with us it’s all about servicing the animals. We are asking for anyone passionate about our mission to help us continue the work we do. We are most grateful for all we have accomplished through the years and continue to accomplish. Thank you for sharing and supporting us. We need people who love animals and people. 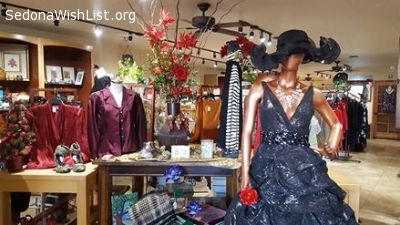 Looking for volunteers who are interested in working in a unique high quality retail thrift and artist boutique the Red Rose Thriftique in the Village of Oak Creek, Sedona. We are open 7 days a week and need volunteers for a variety of shifts and hours. We are a very small volunteer based organization that makes a huge difference in the community by offering FREE spay and neuter services to pet owners that are financially challenged. Free spay and neuter makes a difference because low cost clinics can be costly to pet owners on a budget costing up to $100.00 per animal based on weight. We also specialize in assisting homeless animals with spay/neuter, vaccinations and medical and finding forever homes. In addition to providing sponsorship in a transitional home for pet owners who find themselves and their animal existing in extreme weather conditions living on the streets. These are just some of the things we do as "People Working for Pets"
We need people who love people and pets. We need more veterinarians willing to provide rescue pricing as we have pet owners wanting and desperately needing the services for their pets, not to mention the homeless animals. Our two long term, dedicated, compassionate veterinary partners are not able to service us at this particular time. They are very limited normally to the amount of animals they can see through our organization. They have many of their own clientele requiring their services and they are sole practitioners still trying to help out an animal welfare organization because it’s important to them as veterinarians to give back and they are passionate about our cause and the work we do and the animals we serve. Another problem is many veterinarians will not provide services to feral felines so they will not assist us with our TNR program either. We have had to cut back drastically in the last 12 months on the services because of this situation. You are probably wondering have we reached out to all the additional veterinarians in the area……the answer is yes and multiple times, with no luck. One generous veterinary clinic in the Village of Oak Creek is in the process of trying to assist us at least temporarily. We cannot predict when things will change. Who knows what the future holds in 2018? Perhaps we will be fortunate to find a generous, retired, veterinarian willing to volunteer their time to helping our mission or we will be provided with a mobile unit or clinic is in our future. We encourage our supporters to help us find a veterinarian either a volunteer or a new professional to the area or one that is contracted. When you support Red Rose 100% of the proceeds from our fundraising efforts from the Red Rose Thriftique and our Red Rose Art Shows go to the overall mission of Red Rose Inspiration For Animals. 100% of a monetary donor’s donation goes directly to assisting the animals. No administrative cost or salaries as we are a small, volunteer based organization making a huge difference in the lives of animals throughout the Verde Valley. On our 990 for the year 2016 we had a 99.98 percent rating for public support which we are quite proud of, as with us it’s all about servicing the animals. We are asking for anyone passionate about our mission to help us continue the work we do. We are most grateful for all we have accomplished through the years and continue to accomplish. Thank you for sharing and supporting us. Give the Gift of Love through FREE Spay/ Neuter Helping Felines and Canines in Need. At Red Rose we have always believed Free Spay and Neuter is the Solution to Over Pet Population. For years, when only a few local organizations were providing low cost services we were offering FREE Spay/Neuter Services all along. In addition unknown to many pet owners we at Red Rose were sponsoring to have their animal spayed or neutered for FREE through those low cost clinics and organizations. As we still continue to offer FREE services today, the need for free services continues to grow today due to extremely limited or suspended low cost clinics in the Verde Valley in the past year and half. We need the communities help to keep up with the demand. Our targeted areas of focus are: Camp Verde, Rimrock, Cornville and Cottonwood. With 9 programs in animal welfare it’s often difficult to fund every single program and continue to keep it fully funded. 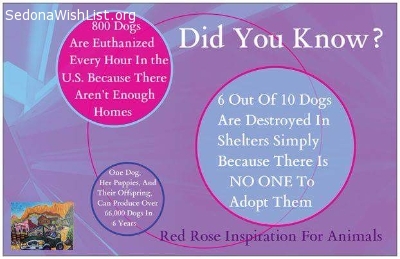 Support a small volunteer based animal welfare organization, Red Rose Inspiration For Animals. As 100% percent of your donations go towards the animals in need. No administrative cost or salaries. Please consider making a donation today as your contribution is most needed and appreciated. Tax deductible checks can be sent to Red Rose Inspiration For Animals, P.O Box 74, Sedona, AZ 86339 or visit the website at www.redroseinspiration.org or visit the Red Rose Thriftique at 41 Bell Rock Plaza in the Village of Oak Creek to make a donation. 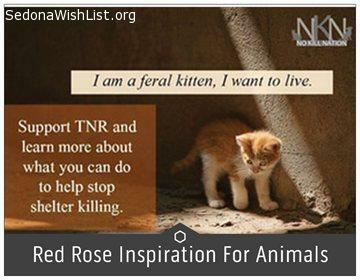 Red Rose Inspiration for Animals is in need of additional funding for it's ongoing TNR (trap/neuter/release program which rescues feral cats). Our need throughout the Verde Valley continues to grow and funding is low. TNR needs $2,000 to alter 40 homeless felines that would otherwise continue to re-produce. Many of these felines are often neglected, abused or injured and reproducing off spring. We take in the kittens young enough to be domesticated, we alter and vaccinate them and provide medical treatment if required then we adopt them out through our collaborative efforts. 100% of your donation goes directly to assisting the animals. No administrative costs as we are a small, volunteer based organization making a huge difference in the lives of animals throughout the Verde Valley. Thank you for your consideration. While also providing sponsorship in a transitional home for pet owners who find themselves and their animal existing in extreme weather conditions living on the streets. Looking for a way to make a difference in the lives of animals this Valentines Day? Have you loved and lost a pet who meant the world to you? Do you want to help other animals through your love for your pet? The founder of Red Rose Inspiration For Animals has and created the organization as a way to give back to animals less fortunate through her beloved Rosey a rescue pup that inspired it all. Red Rose is a local Sedona based 501c3 nonprofit is a very small group of volunteers. Founded in 2009 Red Rose helps pet owners spay and neuter animal companions for free, provides emergency medical services for homeless felines and canines and assists pet owners on a fixed income getting the veterinary care they desperately need. The focus is reducing the over pet population; preventing felines and canines from potentially being injured, abused or neglected. In October, November and December 2017 Red Rose spent over $3,700.00 with 25 spays, 22 neuters and 8 emergency medical needs. However, the need to assist the community continues to grow as we service the whole Verde Valley. Especially Camp Verde, Rimrock, Cornville and Cottonwood. When pet owners on a fixed income find themselves experiencing an emergency situation with their companion animal they are not always prepared to even cover the cost of an exam let alone medication and testing. Red Rose has assisted many pet owners in dire need so that they further delay the animal having to suffer due to financial challenges. Your donation to the Emergency Medical program will continue to help us to make a difference in the lives of these companion animals. We feel fortunate to have been able to make a difference in the lives of so many animals needing our service. Please consider supporting the work, we do, 100% of your donation goes directly to assisting the animals through our programs. No administrative costs or salaries!. Choose the program that touches your heart through Red Rose. . Thank you. 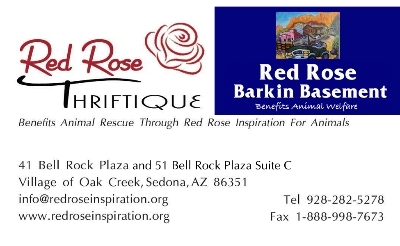 Facebook, Thriftique or Mailing: Red Rose Inspiration For Animals P.O Box 74 Sedona, AZ 86339. With 9 programs in animal welfare it’s often difficult to fund every single program and continue to keep it fully funded. From the beginning we have been supporting the organizations mission and programs through a variety of events such as our small, quality Art Shows exclusively in West Sedona, created to help the non-profit generate revenue for the various programs and future rehab center. In 2014 the vision for the Red Rose Thriftique a unique thrift store and artist boutique originated from the art shows. The concept: to provide an upscale, quality, inexpensive, one of a kind shopping experience for visitors as well as locals; guilt free shopping for a cause located at 41 Bell Rock Plaza in Village of Oak Creek. We are in need of the latest electronics that are in high demand such as ipods for music, ipads as they are popular selling items that in turn can support revenue for our thriftique. 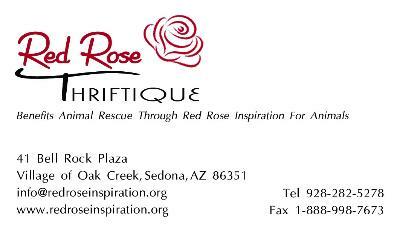 We are also in need of designer clothing for men and women, kitchen and bath items, home decor and small pieces of furniture..
Red Rose Inspiration For Animals a local Sedona based 501c3 nonprofit is a very small group of volunteers. Inspired by a rescue pup named Rosey. In August and September 2017 Red Rose has spent a total of $5,036.34 on programs assisting 52 cats, 20 dogs and 1 rabbit. For more than a year low cost spay/neuter services within our community were extremely limited or non existent which resulted in a tremendous need today. Yet we continued to provide FREE Spay and Neuter during that time and still do today. 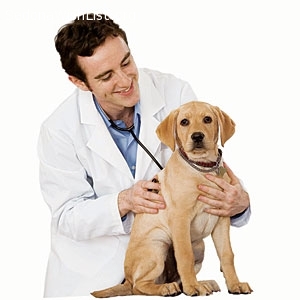 Low cost services are financially challenging for many pet owners with costs generally $75.00 and up to and over $125.00 based on weight, medical situations, and the age of animal that requires additional costs for blood work. Assisting homeless animals with spay/neuter, vaccinations and medical and finding forever homes. 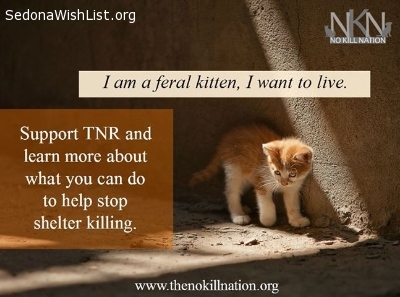 We need people who want to Volunteer to work in the field with our TNR Program throughout the Verde Valley either trapping and transporting or being a foster parent for feral kittens young enough that can be socialized to be adopted. We are the only organization in the Verde Valley with a TNR Program at this time. We also need people who want to work in our retail thrift and artist boutique the Red Rose Thriftique in the Village of Oak Creek either on the sales floor or behind the scenes. If it's time to do some cleaning, please consider donating your home decor, kitchen and bath items, towels, comforters all linens, art work, designer clothing and accessories to the Red Rose Thriftique in the Bell Rock Plaza next to the Bell Rock Vet. Red Rose Inspiration For Animals proudly announces its newest program called Rosey's Party, which is focused on free canine spay and neuter -- any breed, any size and any need to help make a difference in the over pet population of canines throughout the Verde Valley. Red Rose has continued to support homeless animals with their free spay/neuter services and support pet owners who can't afford low cost spay/neuter services at shelters and clinics. Rosey's Party expands upon their Pitty-Party efforts, which focuses primarily on the spay/neuter of pit bulls and pit-mixes because pit bulls are one of the most common breeds in many shelters across the US to be euthanized and are even outlawed in some states. Red Rose still offers no-cost spay/neuter for felines through their General Spay and Neuter Program and TNR (Trap/Neuter Return) Program. Redrock Precision Motors, a local supporter of the community offered to help Red Rose Inspiration, fund Rosey's Party by offering a donation challenge. They will match all donations dollar-for-dollar for the first $1000 raised through the end of August. To help donate to Rosey’s Party, checks can be made payable to Red Rose Inspiration For Animals, P.O Box 74, Sedona, AZ 86339. Red Rose Inspiration For Animals a non profit in animal welfare is looking for a variety of new team members. We are opening a NEW Thrift Store in Cottonwood and need volunteers to be part of every aspect of the store from sorting, organizing, retail, front counter, marketing, pick ups and much more. Consider joining the Red Rose Team. We could also use additional Team Members for our Red Rose Thriftique and art shows starting in the spring as we have 2 upcoming in September. Thank you for considering and inquiring. Red Rose Thriftique supporting Red Rose Inspiration For Animals a non profit in animal welfare is looking for many volunteers willing to volunteer one day a week to work the retail sales position at the Red Rose Thriftique. We are also looking for greeters to work the Thriftique starting in the fall. Hours can be flexible for example 11:00 to 3:00 or 10:00 to 3:00. 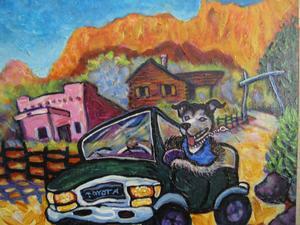 Red Rose Inspiration For Animals works in animal rescue throughout the Verde Valley. We connect animals and people. We are unique in the fact that we are not your typical animal rescue organization. As we do not have a facility to take in animals and we generally don't foster animals. We do however network with others who can take in animals and foster. We provide programs for animal rescue and give back in the form of free spay and neuter as we have for 6 years. In the past 2 months we have spayed and neutered over 100 animals. We provide financial assistance to those who can not afford to take their animal to a vet in an emergency situation, we assist folks who are so dedicated to their animal and find themselves homeless through a transitional home offering a safe place to stay. We provide service dogs to people in need. We trap, spay/neuter and return feral cats to make a difference in the over pet population and much more. We are looking for dynamic volunteers in a variety of capacities. 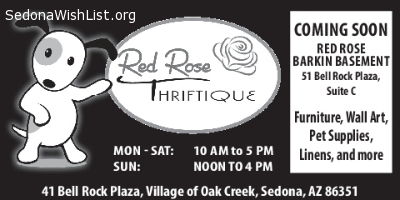 We most especially need for our retail shop Red Rose Thriftique located in the Village of Oak Creek. Please help us to continue making a difference in the community in which we live and helping the animals throughout the Verde Valley. Together we can make a difference. Thanks for considering volunteering or donating to Red Rose.. If your looking to do something meaningful with your old jewelry you no longer wear and want please consider our worthy cause. Artist Items you no longer want...... to replace with new ones? 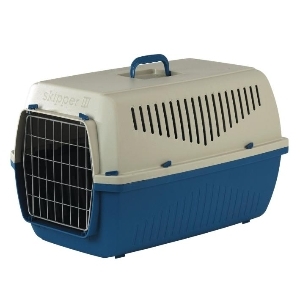 We are wishing for carriers/crates for animals. any size, style or design. We use some for transporting and some we re-sell in our Red Rose Thriftique to raise money for our free programs we provide. 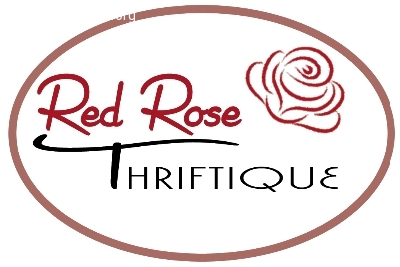 The Red Rose Thriftique is a quality thrift store and artist boutique that generates revenue for Red Rose Inspiration For Animals and the free programs they created to help homeless and rescue animals in need. Red Rose is in need of donations for the Thriftique in the Bell Rock Plaza. As we provide many programs for animal rescue and most especially our TNR Feral Cat Program we need a Vehicle for Transporting animals around the Verde Valley to and from the vets office. We are wishing for a excellent running small to mid sized vehicle for this program. Please contact us if you would consider donating to us. Thank you. We need towels and blankets for our program " Keeping Animals Warm" We offer blankets to people who will not allow their pets in the at night and leave outside in what the officials consider appropriate shelter. We like to offer blankets to keep animals warm. We also need towels for our TNR Feral Cat Program. The Red Rose Thriftique is accepting items for donation. 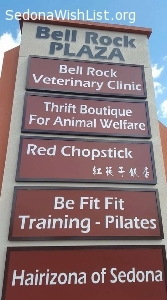 We are located in the Village of Oak Creek (Bell Rock Plaza) and proceeds benefit animal rescue programs through Red Rose Inspiration For Animals, Thanks for considering. We are in search of new or gently used items for our Thriftique. We are grateful for designer clothing, household items, home decor and art work. We are a Thrift Store and Artist Boutique all in one! Therefore go by the name Red Rose Thriftique! Looking for Volunteers to work with our TNR Feral Cat Program in Camp Verde. We need to trap and transport cats to and from the vets office. We are wishing for a more up to date laptop so we can look up and do research of items donated to our Thriftique. We have a received one laptop but need another.. DONATIONS NEEDED- Red Rose Thriftique is a new and unique, quality thrift store and artist boutique. We are in need of new or gently used items from clothing, housewares, books, dvds, shoes, jewelry and home decor. All the proceeds from the Red Rose Thriftique benefit animal rescue through Red Rose Inspiration For Animals. We are 100% volunteer so all the money generated goes directly to our programs for animal rescue. Please help support us and donate and shop today. Thank you for considering. Golden Bone Rescue & Rehab and Red Rose Inspiration for Animals are two amazing rescues in our animal loving community. Both non-profit based here in Sedona, and they operate with an all-volunteer staff. A thoughtful and generous donor has come forward offering to double the donations raised by both Golden Bone and Red Rose up to the amount of $1,000 each. This is a wonderful opportunity for each organization to raise necessary money for their respective program. Red Rose Inspiration For Animals Networks with all rescue groups and we would like to assist another special non profit rescue group in Cornville called Little Orphan Animals that needs food to feed the farm animals. Needing to feed the horses, goats, pigs and more. If you would like to donate please contact Red Rose for more information at info@redroseinspiration.org or call 928-282-5278. Thank you for considering. For years now Red Rose Inspiration For Animals has been offering FREE spay and neuter services throughout our community to pet owners in the Verde Valley who can't afford the low cost services offered by other organizations. Even low cost can be expensive for a large canine. Spay and Neuter is part of our mission statement. Red Rose has spent over $40K through our special programs. The goal has and will always be to decrease the over pet population of felines and canines that exists. Red Rose Inspiration For Animals Networks with all rescue groups and we would like to assist another non profit rescue group in Cornville called Little Orphan Animals that needs food to feed the farm animals. We are an animal rescue org based in Sedona that assists homeless, injured and abused animals throughout the Verde Valley with programs that provide free services. We also assist pet owners who have fallen upon hard times. Red Rose is all volunteer based and 100% of your donation goes directly to any of the programs you choose to support for felines or canines. Please visit our website at www.redroseinspiration.org and LIKE us on Facebook. Thank you! We are ALL Volunteer based in Sedona and help felines and canines within the Verde Valley. We help animals belonging to pet owners who can't afford the low cost spay neuter services and we provide many FREE Services along with assisting homeless and injured animals. Red Rose Inspiration For Animals provides free spay and neuter services to canines and felines. Pet owners who can't afford the low cost services offered. We are organizing our storage units and we are wishing for plastic bins with or without lids, laundry baskets, shelving of almost any type, wood, metal or stainless. 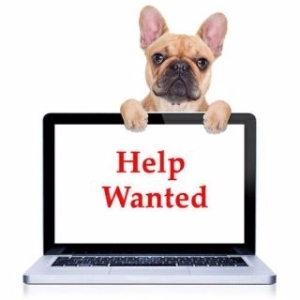 We are in need of slat boards from commercial retail locations and racks, and or displays from retail shops who may have closed or are closing. Still in search of volunteers, large crates and we are in need of funding as 100% of your donation will go to the TNR Fund (Trap/Neuter/Return) so we can continue spaying and neutering to stop the over population that exists. Aside from the Jerome Human Society we are the only organization in the Verde Valley doing TNR and we need to continue for the homeless cats. We are in need of ranches that are looking for Barn Cats....these cats are not adoptable because many of them are shy or afraid of human contact. These feral cats make excellent Barn Cats since they require little attention. They simply need a place that is safer than the busy streets that they are being rescued from and in return they will keep the rodent population down at your ranch. Thank you to Priscilla Hardin for donating a computer tower and scanner to Red Rose Inspiration For Animals. Most appreciated!